Reroofing can be a significant investment, so don't trust the job to just anyone. EASY ROOFING in Tyler, Texas, specializes in new roof installation, reroofing, and re-decking for residential customers. 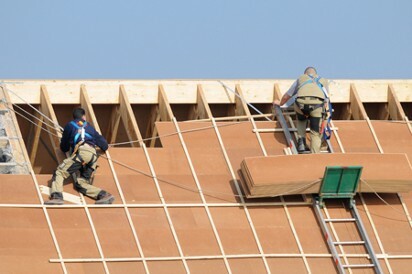 Makeover your roof with our re-decking, reroofing, or new roof installation services. We offer composition, 20-year 3-tab, 25-year 3-tab, or 30-year laminated shingles with a lifetime warranty, and our labor is guaranteed for five years. We do not require any funds in advance when you sign a contract; you simply pay upon completion of the job. Before beginning your roofing project, we remove existing shingles, provide professional cleanup, and use big magnets to make sure we get the nails. We lay new felt, depending upon you needs, and then we lay your shingles of choice. Our services include new flashing and drip edge. Turn to our team for reliable roof ventilation systems, such as whirlybird turbines, ridge vents, and power vents. Ridge vents are our most popular type. Contact us to learn more about our reroofing and new roof installation services.